Locatie: 14Mera, Kallirhois 10, Athens (Acropolis metro station & Vouliagmeni tram station). 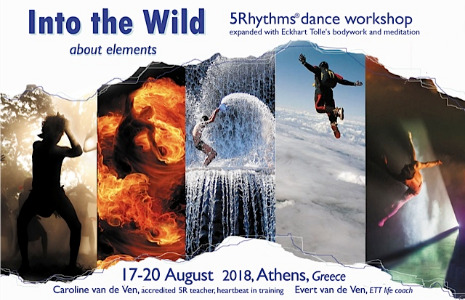 In this long weekend we use Gabrielle Roth’s 5Rhythms flow, staccato, chaos, lyrical and stillness as our rich resource, reliable guide and cheering support to dance into the wild, to explore bits and pieces of our own unique wilderness from the elements earth, fire, water, air and ether. Form the power of Now, we will practice to trust our adventurous feet wherever they tread ground, to live truthfully from our boisterous, sparkling heart, to softly drop into the turmoil of our troubled water, to gently tickle ourselves wide open; sharing magical jungle and entering the mystery of all the invisible that unites us.